SALLY Bolton, the woman behind the success of the 2013 World Cup, has been appointed to the board of the Rugby League European Federation. Bolton, who was general manager of RL2013, replaces Richard Graham, who became the RLEF’s first independent director in 2011. RLEF chairman Maurice Watkins said: “On behalf of my fellow board members, I am delighted to welcome Sally to the board. We are three years away from the end of our current eight-year strategy and it is time for the Federation to begin considering its next strategic cycle, a process in which Sally can play an integral part. 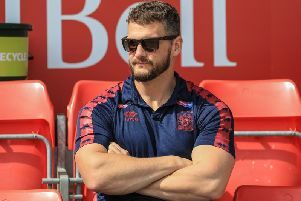 Bolton, who is currently managing director of World Athletics Championships 2017, has held several roles at the RFL and is a former chief executive of Wigan. “I’m delighted to be joining at such an exciting time for the development of the sport internationally, but particularly in Europe,” she said. “Following my involvement in the delivery of the World Cup in 2013, the opportunity to play a role in securing the legacy is very exciting”.